Habitat fragmentation is one of the most prominent effects of anthropogenic ecosystem degradation. However, despite the accumulating evidence that anthropogenic habitat fragmentation acts negatively on the dynamics and viability of many species, rainforest fragmentation can occur naturally. The need to disentangle ‘natural’ fragmentation processes from (often) very recent anthropogenic effects poses a methodological challenge in the field of conservation genetics. Additional challenges include sampling schemes that can generate false signals of population size changes or population genetic structure. Finally, limited analytical power often results from restricted sample sizes, numbers of markers, or their informativeness. We reviewed the available literature on the effects of habitat fragmentation in non-aquatic tropical animal species over the last 10 years to ask what has been learned as a result of the increasing attention paid to these methodological issues. Fifty-four studies contained relevant datasets on the question of fragmentation effects in 74 animal species. Primates (n = 18) and passerine birds (n = 17) contributed most species to the survey. Unambiguous signals of fragmentation effects were reported in 33.8 % of species, whereas the remaining species showed either equivocal (36.5 %) or no evidence (29.7 %) of fragmentation effects. Our review further reveals that uneven sampling cannot be ruled out as possible explanation for many of the reported genetic bottleneck signals and genetic structure effects. Based on the reviewed evidence, methodological (e.g. improving sampling schemes, multiple analytical approaches, added value of different markers) and conceptual recommendations offering a better understanding of general and species-specific evolutionary responses to fragmentation are formulated for future studies. 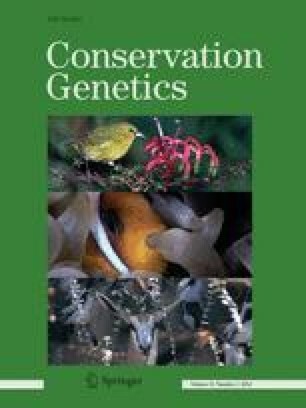 We thank the organizers (Dr. Chris Kettle and Aline Finger) of the gtö symposium 2012 in Erlangen/Germany on “Fragmentation Effects in the Tropics” for the invitation to contribute this review to this special issue of Conservation Genetics. UR acknowledges the continuous support of the Institute of Zoology, TiHo Hannover and in particular Elke Zimmermann. MWB acknowledges the Royal Society, Cardiff University, the Leverhulme Trust and Darwin Initiative for financial support for tropical fragmentation studies and their dissemination. Finally, thanks go to two anonymous reviewers for their comments that helped to improve the manuscript considerably.